Brendan Ogle speaking during the Apollo House occupation. 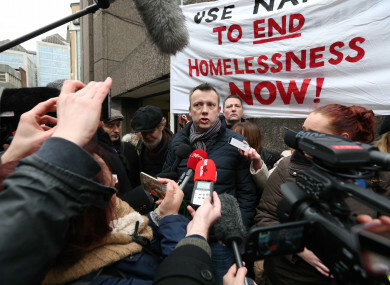 RTÉ’S DUBLIN CORRESPONDENT John Kilraine has initiated legal proceedings against Unite trade union official Brendan Ogle, relating to comments made around the time of the Apollo House occupation last winter. The action alleging defamation is related to an RTÉ report in January 2017 saying that Unite sought an exemption from providing social housing at a property it owned in Dublin city centre. This was around the same time that Ogle was an activist for the homelessness crisis at Apollo House. Ogle initiated legal proceedings against RTÉ over the story last April, but Kilraine has launched a suit of his own this month. The RTÉ story in January 2017 said that a trust connected to Unite applied to be exempted from social housing for a development at its former HQ. Unite has applied to turn the Merrion Square building into one residential unit, with an apartment building behind it, and the union’s trust applied for an exemption from using those units for social housing. That application was granted by Dublin City Council in December 2016, on the same day Ogle gained access to Apollo House. Use of the exemption – regarded as routine for a development such as this – and the fact that the building had been lying idle for years, as the housing crisis worsened, led to accusations of hypocrisy against Ogle and his union by some activists. Unite, however, said that this perception was “disingenuous”. The union said it worked with charities working in the area of emergency housing provision to inspect the premises to see if it was suitable for their needs. At the time, a spokesperson for Focus Ireland told TheJournal.ie that Unite had asked the organisation if it was interested in using the building “while the union was developing its own plans for future use of the premises”. However, it was reviewed by Focus Ireland and found to be totally unsuitable for any of our projects or housing as it would have required extensive refurbishment, significant investment and planning permission. Given the offer was for three years or less it was not taken up. Unite also said it had asked to be given two days to respond to RTÉ’s query, but the broadcaster ran with the story anyway. Its statement from the time also names Kilraine, and said he would have been able to run a “far more accurate story” had he waited for the union’s response. In response, RTÉ strongly condemned the personal nature of this statement, and said it stood by the report. In a Facebook post in January 2017, Ogle named Kilraine in the post that criticised RTÉ’s coverage. In a statement on his Facebook post on Saturday, Ogle said he “stand[s] over every word” of what he said in this post last January. He said: “I wrote a Facebook post, pursuant to my obligation to defend myself, in the context of my activism and the reportage of same. I have come under some pressure to drop the legal action to clear my name and I have refused to do so – justice should not just be for privileged elites, the establishment and the monied classes – but in this regard solicitors for John Kilraine have issued intimidatory legal proceedings against me in recent days because of that FB post, and related private two way communications. Comments closed for legal reasons. Email “RTÉ journalist takes Apollo House organiser Brendan Ogle to court over Facebook post”. Feedback on “RTÉ journalist takes Apollo House organiser Brendan Ogle to court over Facebook post”.